Jamie Jones: 7 - Almost saved the Ipswich penalty and continues to justify his inclusion with solid goalkeeping. Reece James: 7 - Not quite up to his usual brilliance, but picked up in the second half and laid on the equaliser. 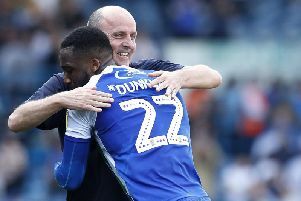 Chey Dunkley: 5 - Expressed remorse on social media for giving away the penalty but not his most assured display. Danny Fox: 7 - Back after concussion and led the backline well, will be a great signing moving fowards. Kal Naismith: 6 - Put some decent deliveries in as usual but found it tough at the other end. Sam Morsy: 7 - Spent the last quarter at centre-back following the reshuffle but performance levels didn’t drop. Lee Evans: 7 - Took the initiative well and was unfortunate more didn’t happen elsewhere, tireless effort. Anthony Pilkington: 6 - Plugged away without reward and tugged on the hour, more to come from him. Josh Windass: 5 - Didn’t make the most of his opportunities in the final third. Michael Jacobs: 5 - Couldn’t quite find the way through but effort not in doubt. Leon Clarke: 5 - Enterprise led to Ipswich’s red card but squandered several gilt-edged chances in front of goal. Nick Powell (for Dunkley, 61): 7 - Great to see him him back in the fold and justified a future starting spot. Callum McManaman (for Pilkington, 61): 7 - Wanted the ball always and looked to get forward at every opportunity. Joe Garner (for Windass, 81): 7 - Saved Latics with a vital equaliser against his former club despite limited minutes. Subs not used: Christian Walton, Cedric Kipre, Darron Gibson, Gavin Massey. Ipswich (3-4-1-2): Bialkowski; Pennington, Chambers, Knudsen; Bree, Chalobah, Nolan, Kenlock; Judge; Keane, Quaner. Subs: Gerken, Edwards (for Quaner, 46), Skuse, Jackson (for Keane, 64), Downes (for Judge, 78), Nsiala, Dozzell.